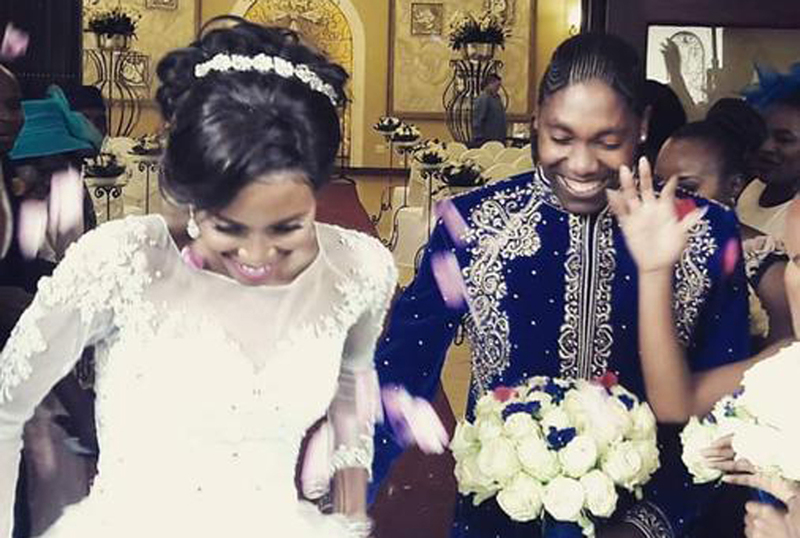 Caster Semenya, the Olympics 800m gold medalist married her partner Violet Raseboya at the Chez Charlene in Pretoria on Saturday. Their white wedding ceremony was described as extravagant and lavish by most attendees and it coincided with the Olympic gold medalist’ 26th birthday. The event was attended by the couple’s close friends, relatives, athletes and some local celebrities. Caster wore a dark blue suit which was embroidered with gold along with velvet slippers. Violet wore a traditional full length white gown and she did hair in an ‘up-do’ which she finished with a diamante band. Close friends and family, who included the Olympian’s parents and four sisters, wore dark blue and gold outfits as well so as to complement Caster’s collective. The couple later on changed into sun-colored traditional outfit with beaded accessories for their reception and took to the floor for a traditional dance. The athlete shared a string of intimate photographs on her Instagram page. The couple met when they were teenagers and dated for quite a number of years. Caster’s victory at the Olympics in Rio last year was bitterly contested and she credited Violet, 30, and her home fans with providing the strength and confidence to confront her critics. Caster who has naturally elevated levels of testosterone and was forced to undergo humiliating gender testing to prove she was female, was once forced to take medicine to suppress her testosterone amid claims she had an unfair advantage.